Located at 112th and Adams Street, Prairie Pines is a 145-acre tract of land with 35 acres of trees and shrubs consisting of over 200 woody plant species, and over 55 acres of native grasses & forbs including 10 acres virgin prairie. The arboretum specimens are located by gps. The property is owned by the University of Nebraska Foundation and managed by the Nebraska Forest Service. University has a short description of the site here. Beginning farmers who complete the Growing Farmers Workshop Series are eligible to apply to farm at Prairie Pines. This site provides the advantage of allowing beginners to start their farm business with support from Crops staff and experienced farmers. First year farmers work on the farm, and have their own plots to tend, as part of the learning process. Beginners gradually take on more responsibility and land as they learn more, and can stay at Prairie Pines for three to five years. Equipment and supplies are available for beginning farmers to use at Prairie Pines. In 1959, Walt & Virginia Bagley purchased a farm that was typical of the era prior to the sixties. It had been devoted to row crops, milk cows, hogs & chickens. The cropland was eventually converted to grass & trees. Virginia and Walt wanted to develop a diverse environment that would provide a pleasant habitat for all beings – plant & animal! Walt was an assistant professor of Forestry at the University of Nebraska from 1955-1985 where he taught horticulture & Forestry classes, managed Horning Research Farm and conducted research involving windbreaks, woody plant provenance & agroforestry. In retirement Walt co-authored the woody plant resource book, “Woody Plants for the Central and Northern Prairies” with Richard Sutton, published in 2002. In 2015, UNL students created a video and art show at Prairie Pines. Watch the video here. Prairie Pines got its name because it is the first choose & cut Christmas Tree Farm in Nebraska. It operated from 1960 until 2001. Walt Bagley was a founding member of Wachiska Audubon. Prairie Pines is protected from development by the first Conservation easement in Nebraska, established in 1982. Prairie Pines was the first home of Raptor Recovery Nebraska (under the direction of Betsy Hancock) from 1978 until their move in 1995. Prairie Pines became an affiliated arboretum site of the Nebraska Statewide Arboretum, Inc. in 1980. Prairie Pines was gifted to the University of Nebraska Foundation for purposes of education and research in 1992. The Foundation established Prairie Pines as a research & education site for the University of Nebraska School of Natural Resources in 1992. Community Crops Growing Farmers Incubator Program‘s first season at Prairie Pines was in 2013. 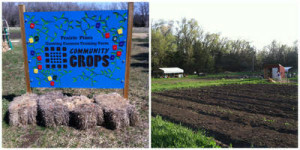 Community Crops uses 5 of the 145 acres of the site for growing vegetables. The Community Crops training farm site at Prairie Pines is located in the Stevens Creek watershed, an area of future growth for the city of Lincoln. In collaboration with the Prairie Pines Pals, Community Crops is looking for additional land in the area that can be protected long-term for wildlife and growing food. Walt and his wife Virginia created the first conservation easement in the state of Nebraska to protect their property, but more land needs to be protected for the long-term. Landowners are encouraged to donate tax deductible easements or sell their right to develop at market value. They continue their life style. Reduced valuation reduces property taxes. Please contact us to discuss adding your property to the belt of green. Barb Brockley, Interim Executive Director of Community Crops, is at 402-474-9802 or barb@communitycrops.org.